PTO and PTO Parts. Clutch Pumps and Muncie PTO Parts. Deweze Clutch Pump, Deweze Parts, Pump Parts, Harper Industries, Jerr Dan PTO Parts. Hydraulic Pumps and Cable or Air Shift PTO's. Electric Shift PTO. Need PTO or clutch pump parts? We've got you covered. We have parts for power take off systems and clutch pump systems. 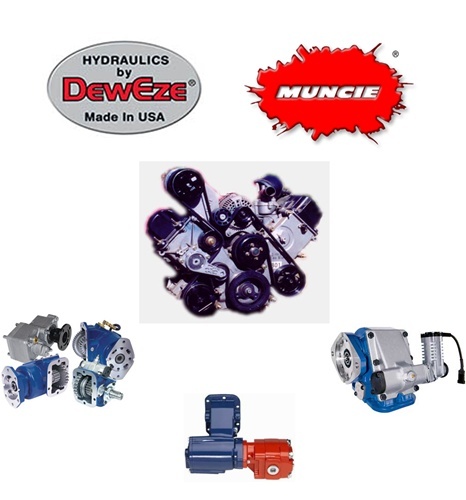 We are distributors for Muncie Power Products and Deweze - Harper Industreis Manufacturing. We stock or can order: clutch pump kits, PTO's, PTO solenoid kits, housing, gears, gaskets, mounting kits, filler block kits, lectra shift parts, PTO cables, clutch shift PTO's, clutch pump belts, clutches, hydraulic pumps, mounting kits, and more.